Has your dog ever buried his bones, or even his favorite toys, in your backyard? Well, if he has, hopefully he doesn't make it a habit to dig them up and bring the dirty mess back in your house! What Makes My Dog Want to Bury Stuff? The short answer is that it's an instinct. You see, ancient dogs survived on anything that they could scavenge or hunt. If they managed to get ahold of more than they could eat in a single meal, they had to come up with a way to make sure that the excess would still be available when they became hungry again. Dogs protected their leftover food by burying it. The dirt helped keep their food fresher longer by protecting it from sunlight. In addition, the temperature in the ground was cooler than in the air, so burying food helped it to stay fresh for longer. It also protected the food from flies, and prevented other animals from stealing it. When the dog was hungry again, he would return to his hidden cache and dig up his leftovers. Today, dogs are given their food in portions, so they no longer need to save any for a later meal. However, many of them still have the instinct to bury "extras" in a secluded spot for later. Essentially, your dog is just following an ancestral urge. So even though you feed your dog every day, you can’t take that "save it for later" mentality out of him. The same goes for those toys, and sometimes some other household items like the TV remote. 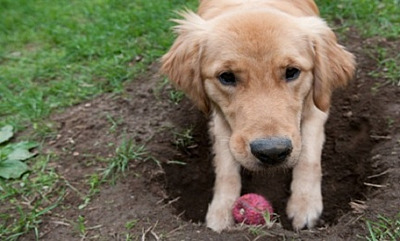 Make your dog's favorite digging spots less attractive. You could try covering the spot with chicken wire or something that is not so paw-friendly. Try offering your dog a less-destructive option: Show him how he can bury his favorite toy under a blanket, or create a sandbox for his burying enjoyment. Pick up most of your doggie's play things and limit your dog's access to one bone and one toy at a time. Vary the type of dog bones and toys from time-to-time; this will help to keep him interested. Limit the quantity of extras and provide some variety for your doggie, and you may just lessen his motivation to take those items out to the backyard and treat them like a buried treasure!